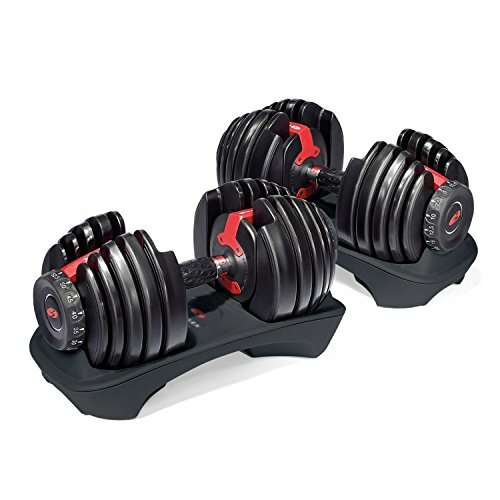 Adjustable dumbbells are useful for replacing sets that include multiple weights. This equipment is an effective home workout solution that may just save you frustration, money, and space. 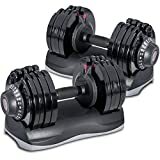 The best adjustable dumbbells can be used by just about anyone looking to increase muscular strength and endurance and come in designs for both intermediate and advanced users. 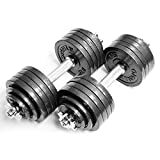 With the many different adjustable dumbbell configurations out there, the below products have been chosen because of their popularity, effectiveness, and overall impressive designs. Certain brands like Bowflex, Omnie, and Powerblock have all made user-friendly tweaks to their products for 2018. 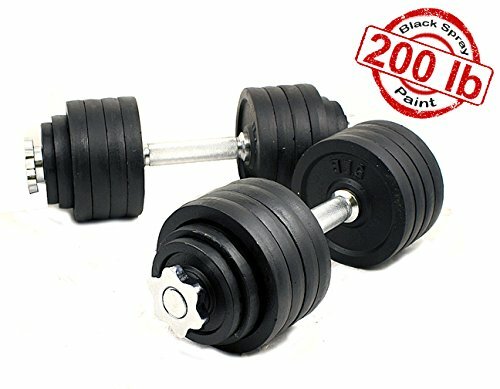 Let’s take a look at some of the best adjustable dumbbells for sale presently! Our best adjustable dumbbell list starts with an easy-to-use and cost-effective option. This Core Fitness® set is priced well and comes with lots of options and versatility. The quick change weight adjustment feature makes working out just that much easier. It’s got a storage compartment, soft grab handles, and can go up to 50 pounds on each handle in 5-pound segments. 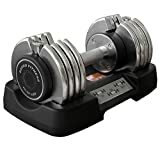 A singular 50-pound dumbbell with a convenient storage tray, the Bayou Fitness adjustable dumbbell is great for users who want a combination of fitness and storage space savings. It features a very compact and easy to use design and can range in lift weight from 10 to 50 pounds. Heavy-duty construction and chrome plated steel make it a very durable option. 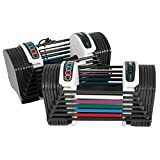 A highly effective training tool that is cost-effective and ideal for strength building, these Power Block dumbbells are great for anyone looking to streamline their workout routine. They can be adjusted from 3 to 24 pounds in increments of 3 pounds at a time. They’re easy to use, and designed to be fully utility friendly. They’re also compact, balanced, and have padding for wrist protection. Our best adjustable dumbbells list wouldn’t be complete without a true heavy-duty option. The Starring model represents that option. The Starring two-piece dumbbell set can be weighted at a whopping 200 pounds. 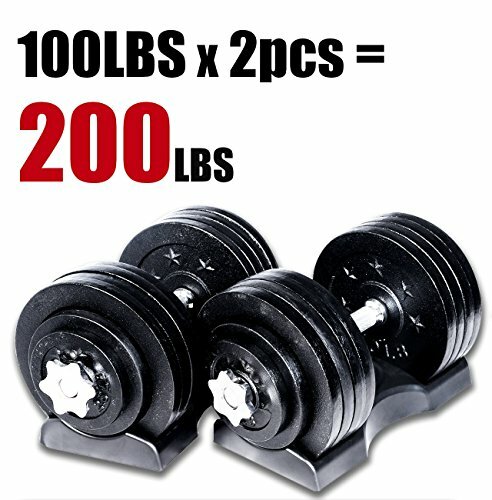 That means it can replace a full 18 piece professional dumbbell set! It’s designed with gym-quality cast iron and can even be set up in adjustable increments of 5 or 100 pounds. 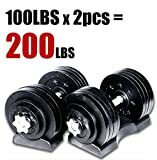 If you’re into serious lifting but want to do it from home, this may be the best adjustable dumbbell set for you. These dumbbells give you plenty of options! That’s why they are featured here on our list of best adjustable dumbbells. They come in a pair so that you don’t have to switch arms and can do your full workout all at once. Each dumbbell can be adjusted from 5 to 52.5 pounds in increments of 2.5 pounds at a time. They combine 15 sets of dumbbells into one. On top of that, the set also comes with a two-year warranty. 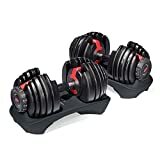 This Omnie set has been rated as some of the best adjustable dumbbells for 2018 for a few reasons. They utilize a cast iron design that is comprised of high-quality materials and feels solid. The rust and oil proof enamel finish adds to their utility. 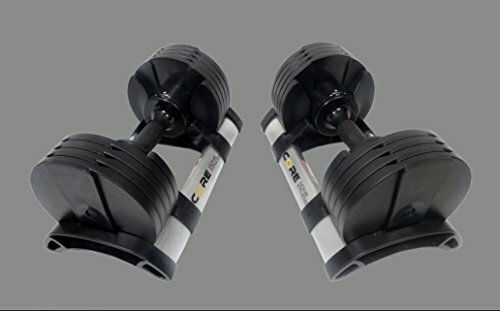 These dumbbells come in a pair and can be set from 5 to 52.5 pounds. They’re ideal for users who engage in CrossFit or WOD weightlifting. Versatile, durable, and easy to use, Merax has been making powerful equipment for years. When it comes to the best adjustable dumbbells for 2018, they may have outdone themselves. 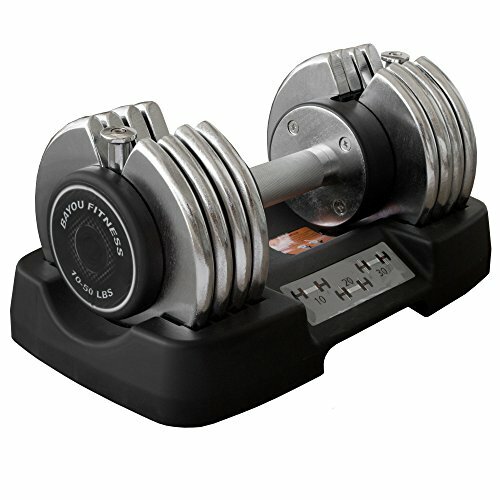 For the serious weightlifter who wants equipment to use at home, the adjustable dial dumbbell may make an excellent choice. They can be equipped with weights all the way up to 71.5 pounds, starting at 11 pounds, and adjusting at increments of 5.5 pounds. So there you have it! Our comprehensive list of the best adjustable dumbbells today. Though the top-rated Merax system is a definite favorite. 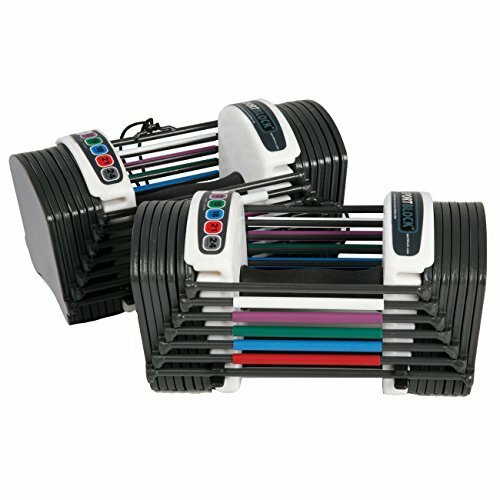 Sets by Bowflex and Starring are also great choices with the Core Fitness® set being great for newer users. Check them out for yourself and let us know what you think!